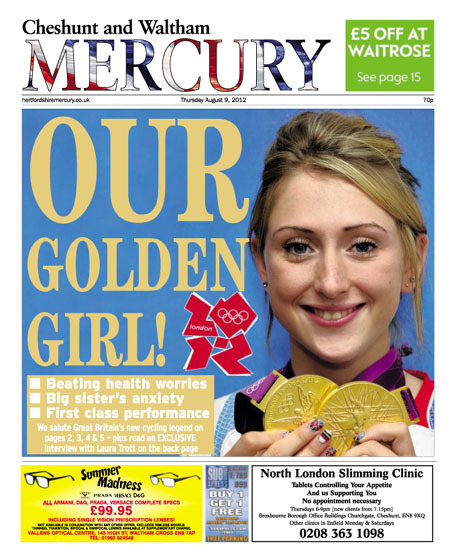 Britain’s local and regional newspapers have been on their mettle as the medals flowed for Team GB at London 2012. 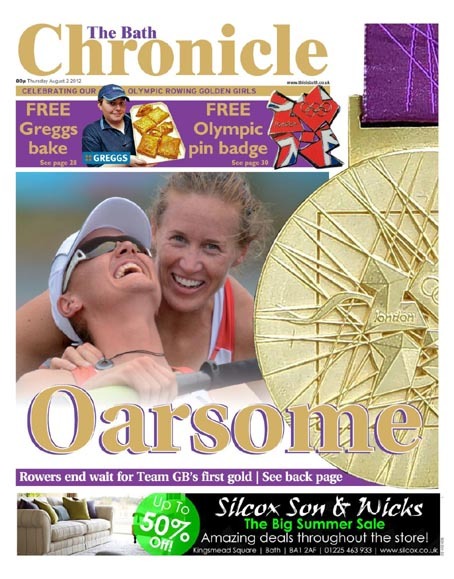 They included a wraparound front and back page by The Cornishman featuring gold medal winning rowers Heather Stanning and Helen Glover, who is originally from Penzance. 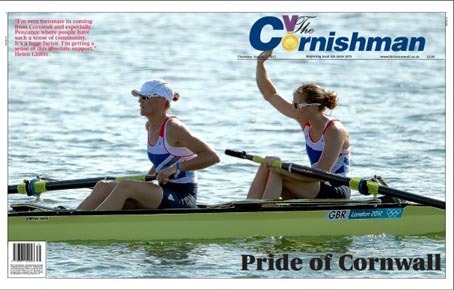 Cornishman editor Jacqui Walls said: “It was such a monumental achievement by a local girl who only took up rowing four years ago and is extremely well known and well respected in the Penzance area. We really wanted to do her and her family proud. 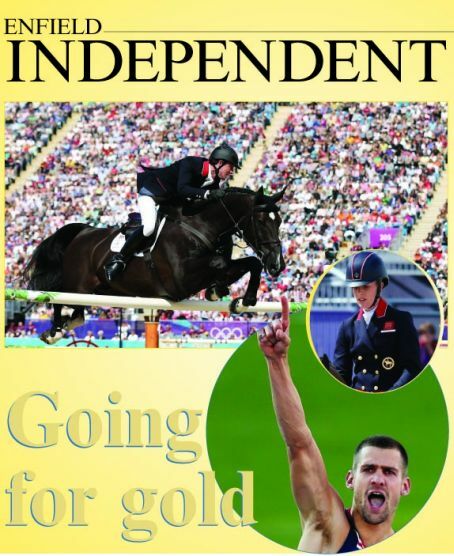 Here’s a selection of some of the best front pages we have seen so far. 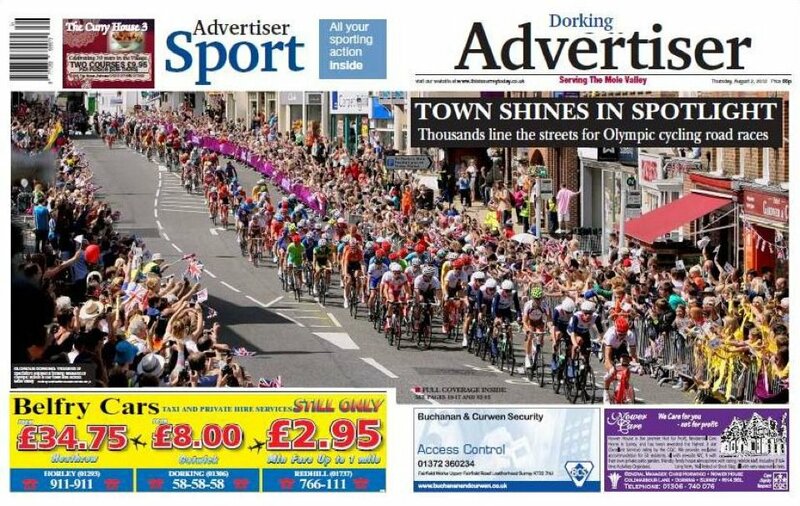 If you have a medal-winner on your patch and would like your front page featured here, send it to us at editor@htfp.co.uk. 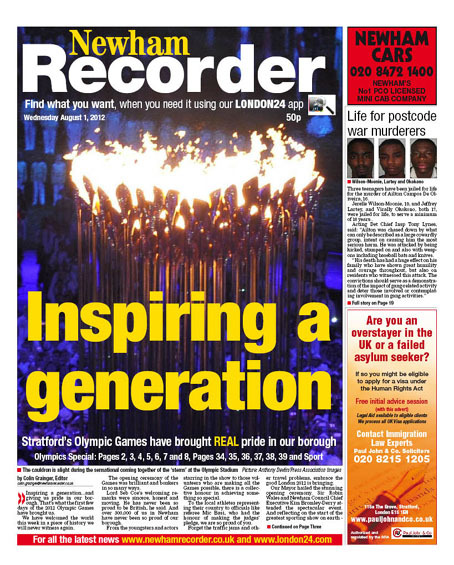 The Newham Recorder, which circulates in the Games' host borough, kicked off its coverage with this front page report on the opening ceremony. 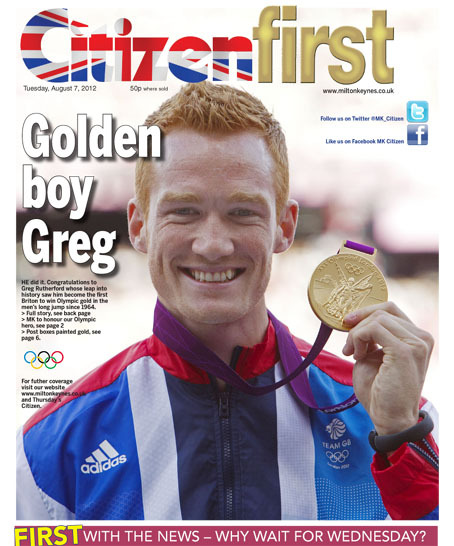 Plymouth's The Herald celebrates the bronze medal secured by diver Tom Daley, who is from the city. 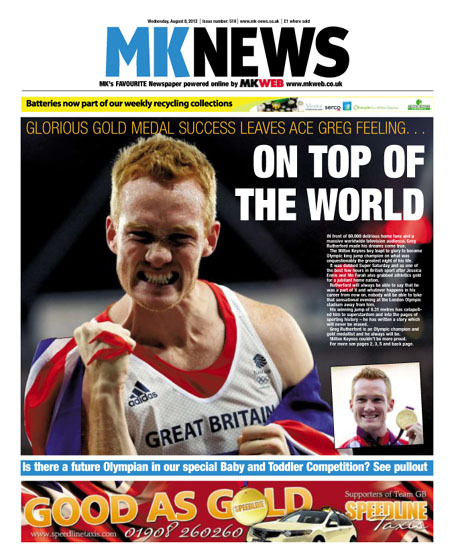 The Milton Keynes News celebrates Saturday's surprise gold medal for Greg Rutherford in the long jump. And not to be outdone, here's how the rival Milton Keynes Citizen covered the story. 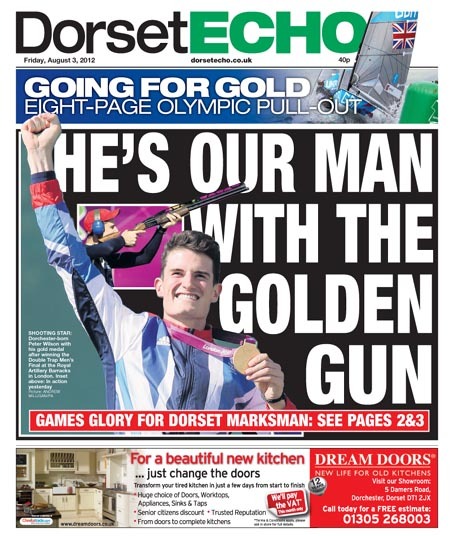 The Dorset Echo looked to James Bond for inspiration for its front page headline on Dorset-based Peter Wilson's triumph in the double trap shooting event. The Bath Chronicle's coverage of Heather Stanning and Helen Glover's rowing gold. Glover went to school in Somerset while the duo were originally put together at Bath University’s elite athletes centre. 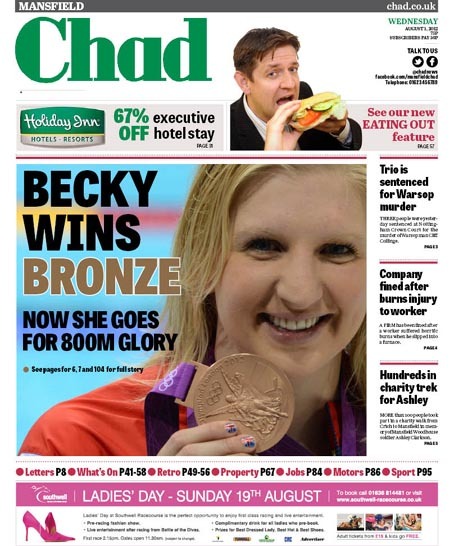 Mansfield swimmer Rebecca Adlington's bronze medal in the 400m freestyle is given the full treatment by the Mansfield Chad. 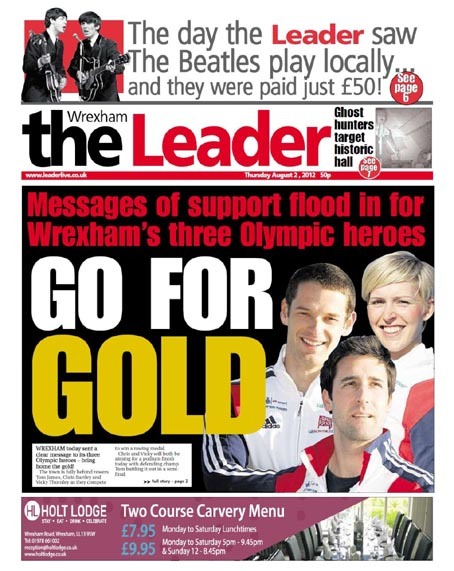 The North Wales-based Leader urges on Wrexham rowing trio Tom James, Chris Bartley and Vicky Thornley in their bid for gold. 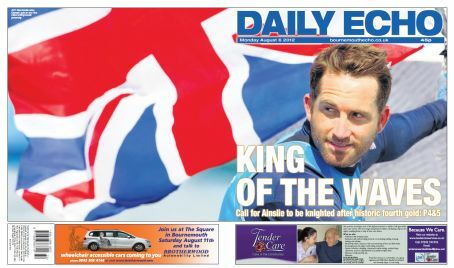 The Cornishman's take on the Glover-Stanning rowing triumph. Ms Glover is originally from the county. 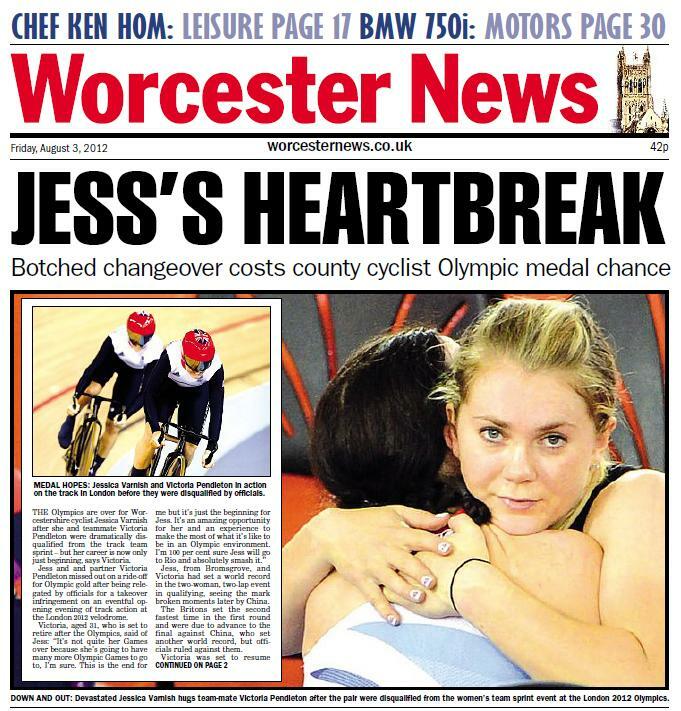 The Worcester News captures the anguish of Worcestershire cyclist Jess Varnish after her disqualification in the womens' sprint alongside teammate Victoria Pendleton. Another wraparound, this time from the Dorking Advertiser featuring the cycling road race which took place on its patch. 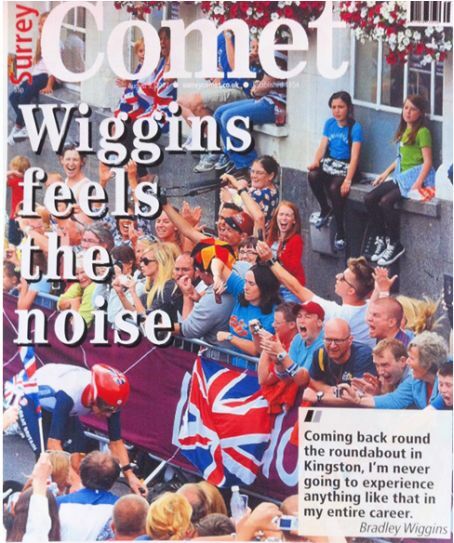 The Surrey Comet features Bradley Wiggins on its front page after he won a gold medal in the cycling road race time trials, which took place on its patch. 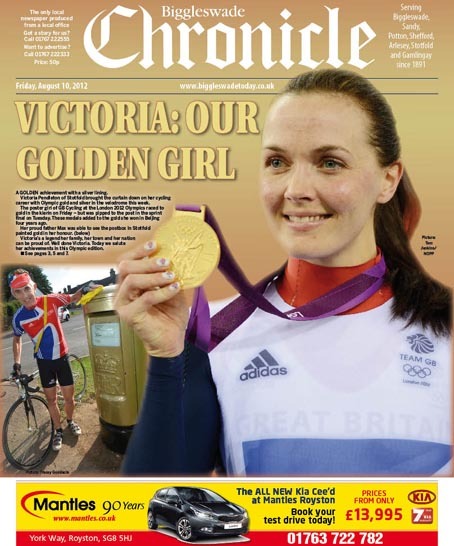 Bedfordshire on Sunday celebrates the achievements of its two cycling gold medallists, Etienne Sott from Bedford and Stotfold-born Victoria Pendleton. 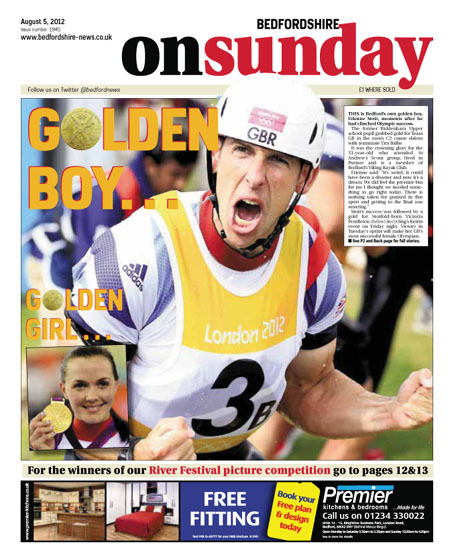 Canoeist Etienne Stott also featured on the front of Bedford's Times & Citizen. 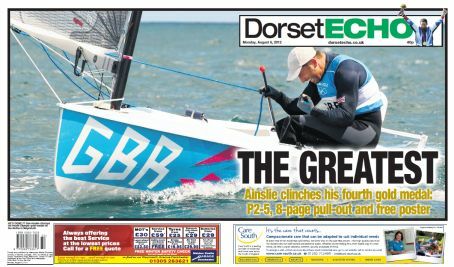 Bournemouth's Daily Echo and the Dorset Echo, below, produced wraparounds following the gold medal success of Ben Ainslie in the sailing, which is taking place off the Dorset coast. Like the Dorset clay pigeon one best – nice effort. MJ News – bet that dark picture printed well?! 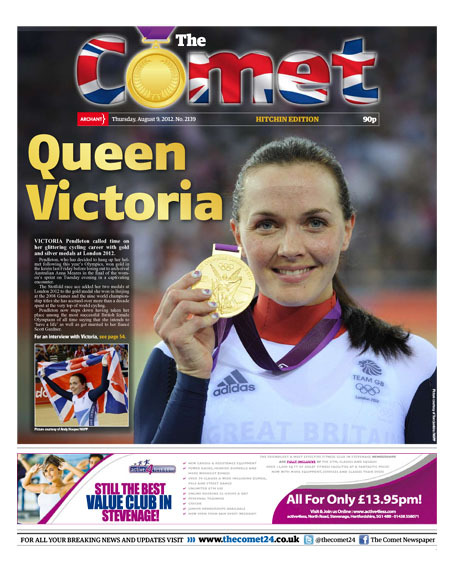 Surrey Comet – White masthead on light background doesn’t work. Is it a readers photo? Wrexham leader, rubbish set of cut outs. Some great front pages: just a note to say Citizen First came out before MK News, so less a case of ‘not to be outdone’ and more the original, and the best! !